I met my dear friend, Jenissa, for coffee the other day. She and I have been best friends for almost as long as I can remember (we met when I was three or four). We were neighbors, we grew up together. I hadn't seen her since before my birthday, she surprised me with a gift. 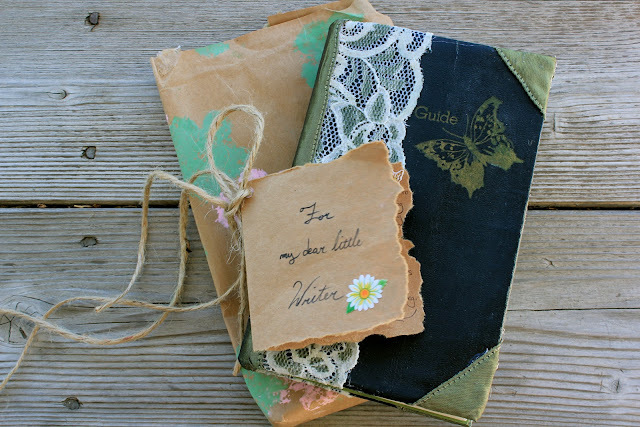 A beautifully handmade journal! She made everything herself from scratch: added the stamp, the lace, even the binding! Isn't it lovely? The wrapping paper was handmade as well. I love homemade gifts! I spent several minutes just admiring its beauty. This is us when we were about seven and nine, with matching dresses of course! Ah, so many years ago! We have shared several tears, smiles, dreams, and laughter over the years. How grateful I am to still hold a close friendship with her! She has had a monumental impact on my life. I would definitely not be the person I am today without her influence. That's a sweet birthday present - i love all the different textures on that journal!